^ Rautian, G. S.; Kalabushkin, B. A.; Nemtsev, A. S. (2000年). “A New subspecies of the European Bison, Bison bonasus montanus ssp. nov.”. Doklady Biological Sciences 375 (4): 563–567. ^ Buntjer, J B; Otsen, M; Nijman, I J; Kuiper, M T R; Lenstra, J A (2002年). “Phylogeny of bovine species based on AFLP fingerprinting”. Heredity 88 (1): 46–51. doi:10.1038/sj.hdy.6800007. PMID 11813106. ^ Guo, S.; Liu, J.; Qi, D.; Yang, J.; Zhao, X. (2006年). “Taxonomic placement and origin of yaks: implications from analyses of mtDNA D-loop fragment sequences”. Acta Theriologica Sinica 26 (4): 325–330. オリジナルの8 March 2012時点によるアーカイブ。. https://web.archive.org/web/20120308221242/http://english.mammal.cn/Magazine/show.aspx?id=2079. ^ Soubrier, Julien; Gower, Graham; Chen, Kefei; Richards, Stephen M.; Llamas, Bastien; Mitchell, Kieren J.; Ho, Simon Y. W.; Kosintsev, Pavel et al. (2016年10月18日). “Early cave art and ancient DNA record the origin of European bison” (英語). Nature Communications 7: 13158. doi:10.1038/ncomms13158. ISSN 2041-1723. PMC 5071849. PMID 27754477. オリジナルの19 April 2017時点によるアーカイブ。. https://www.nature.com/articles/ncomms13158. ^ Palacio, Pauline; Berthonaud, Véronique; Guérin, Claude; Lambourdière, Josie; Maksud, Frédéric; Philippe, Michel; Plaire, Delphine; Stafford, Thomas et al. (2017年1月1日). 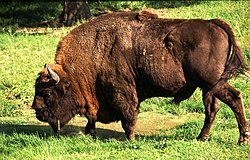 “Genome data on the extinct Bison schoetensacki establish it as a sister species of the extant European bison (Bison bonasus)”. BMC Evolutionary Biology 17 (1): 48. doi:10.1186/s12862-017-0894-2. ISSN 1471-2148. PMC 5303235. PMID 28187706. https://www.ncbi.nlm.nih.gov/pmc/articles/PMC5303235/. ^ Marsolier-Kergoat, Marie-Claude; Palacio, Pauline; Berthonaud, Véronique; Maksud, Frédéric; Stafford, Thomas; Bégouën, Robert; Elalouf, Jean-Marc (2015年6月17日). “Hunting the Extinct Steppe Bison (Bison priscus) Mitochondrial Genome in the Trois-Frères Paleolithic Painted Cave”. PLOS ONE 10 (6): e0128267. doi:10.1371/journal.pone.0128267. ISSN 1932-6203. PMC 4471230. PMID 26083419. https://www.ncbi.nlm.nih.gov/pmc/articles/PMC4471230/. ^ Bork, A. M.; Strobeck, C. M.; Yeh, F. C.; Hudson, R. J.; Salmon, R. K. (1991年). “Genetic Relationship of Wood and Plains Bison Based on Restriction Fragment Length Polymorphisms”. Canadian Journal of Zoology 69 (1): 43–48. doi:10.1139/z91-007. http://article.pubs.nrc-cnrc.gc.ca/RPAS/RPViewDoc?_handler_=HandleInitialGet&calyLang=eng&journal=cjz&volume=69&articleFile=z91-007.pdf. Olech, W. (IUCN SSC Bison Specialist Group) 2008. Bison bonasus. In: IUCN 2013. IUCN Red List of Threatened Species. Version 2013.1.